Over the last five years I’ve heard increasing concern from the meeting professionals community about the deterioration of the quality of our national industry conferences. A recent thread on the MECO community (a great resource for meeting professionals since 2006) describes numerous recent basic logistical failings, and points to what I see as symptoms of fundamental problems with meeting industry associations at the national level. In a nutshell, I think that our industry associations have become too focused on justifying their continued existence financially. They are neglecting their core mission of supporting and representing their members and association meeting attendees. I’ll illustrate with the area where I have most experience: providing education at these meetings. 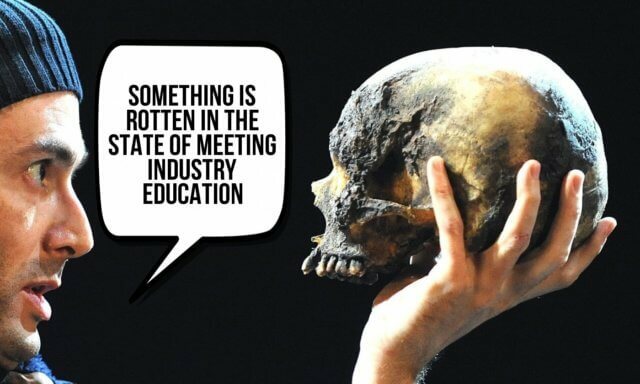 In my opinion (and many other event professionals with whom I’ve spoken) the “educational” content at the national meetings these days is sub-par. I suspect it’s because the processes for choosing it are seriously flawed and completely opaque. I’ve lost count of the conference session proposals I’ve made to meeting industry associations that have wound through multiple months-long steps only to be rejected at the last possible moment with no explanation and a boilerplate request to submit more next year. Meanwhile, it’s clear from a review of industry conference programs that employees of sponsors or trade show exhibitors give large numbers of presentations. Also solicited/accepted are keynote/motivational speakers. These folks get paid large fees and provide exciting presentations with, in my experience, little or no content of long-term value to the meeting attendees. (Think back to the big-name speakers you’ve listened to in the past and — be honest now — how many of them have changed your professional life in any significant way?) But their inclusion looks good on the promotional materials. In my case, the demand for the meeting design and facilitation services I provide has been exploding. (In the first quarter of 2018, I’ve booked more business than all of 2017.) Most clients and meeting industry professionals have yet to experience how effective participant-driven, participation-rich design and facilitation can radically improve their meetings for participants and stakeholders alike. So there’s plenty of work yet to do, and not enough people experienced enough to do it. Our industry conferences are the obvious places to provide this education. My contributions to meeting education are Participate! workshops I design and lead which provide experiences that significantly improve how the participants design their meetings. They are, in my opinion, fundamental education; certainly on a par with the sessions we see at the annual conferences every year on “hot event items”, F&B trends, and meeting management. Yet experiential meeting design is not acknowledged at meeting industry conferences as an overlooked fundamental competency that needs to be offered on a regular basis. Rather, it’s seen as a “hot topic” that can be covered once and subsequently ignored. In addition, industry associations have essentially given up paying for professional education at their events, preferring, it seems, to spend money on the big name players I mentioned above. These days, someone like me is lucky to be offered event registration and expense reimbursement. (Let alone any kind of token fee for the hours it takes to design and prepare a great session.) This further biases session submissions in favor of sponsors and corporations who are attending the event anyway for marketing purposes. Many other independent meeting professionals I know who love our industry, are great presenters, and have unparalleled expertise on important perennial meeting education areas have told me about similar rejections. Most of us have pretty much given up submitting sessions as a result. Some may see what I’ve written as sour grapes. I’ll only add that I’ve been an educator of one kind or another for forty years. There’s a large unmet need for what I and other experts do. And I’m frustrated that meeting associations, whose purported mission is serving our industry, stymie our offers to share our expertise with our fellow professionals. Who owns an event? The usual answer to this question is “the event’s sponsors”, i.e. the people and organizations that decide to hold the event and contribute the resources needed for the event to occur. Sponsors typically define the context, format, scope, and desired outcomes of an event, so they are clearly key candidates to be considered as owners. But I think there are other plausible answers to this question. Increasingly we are moving to event models that make participants generators of event value. Conferences that leverage all the expertise in the room, rather than the contributions of a few experts. Meetings that become what the participants want and need them to be, autofocusing on the topics and questions that are of genuine relevance, rather than sessions predefined six months in advance. Yes, sponsors define an event’s boundaries and make it happen (for which we should all be grateful). But at participant-driven and participation-rich meetings, the shaping and contributions that participants provide are crucial for the event’s success. Without this input, such events are worth very little, so isn’t it fair to say that, under these circumstances, the participants are owners of the event as well? If we think of an event as the thing that happened between the moments when the first attendee arrived and the last person left, we are ignoring the changes in the knowledge, viewpoints, and connections, and the subsequent outcomes that the event created. The participants not only own their event experience, but also the consequences of their participation. The changes that result loop back on the event’s sponsors, influencing their future choices. Thus, participants are event owners because, to some extent, they control what happens next. To conclude, I like the idea that both sponsors and participants are the owners of events. By consciously bringing participants into the realm of ownership, we widen the community that makes the event what it is, and this benefits all the players. Adrian Segar is a truly prolific writer with over 30 years of experience in designing and facilitating productive conferences. His blog offers lots of invaluable posts about conference design, facilitation and peer conferences. If your sessions lack participation or excitement, this is exactly where you should look for advice.